Gary Steel went to a house in the sticks to check out the ambience, man. IT MAKES SENSE when you think about it. Philips is a company that’s strong on lighting, and it’s my guess that most families have got at least one Philips bulb blazing away somewhere in their house. But it’s the lighting that Philips created for its flawed Ambilight series of televisions that paved a way towards Hue, and now Friends Of Hue. 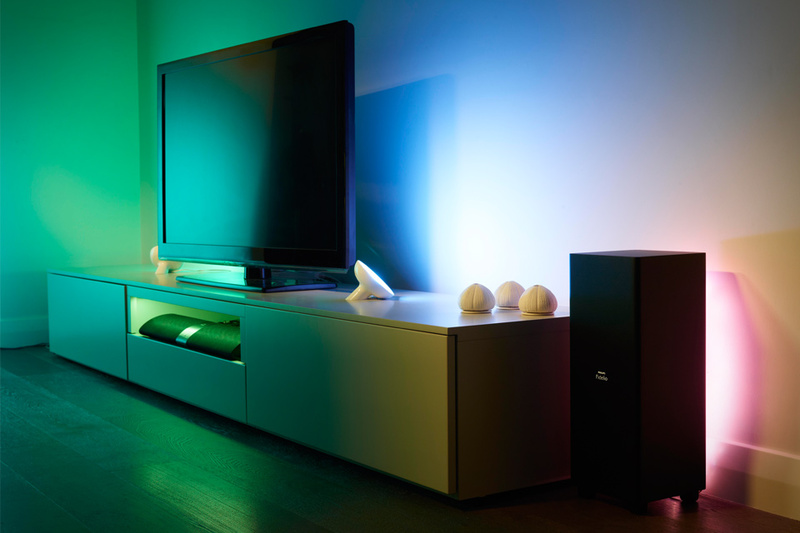 Philips TVs disappeared from our phosphorescent green and bleary land a few years back, and the company seems to now be putting its efforts into its rather excellent soundbars, and new ways of making its lightbulbs turn a house into a home. I was invited to a brand new house in Riverhead, West of Auckland, to check out the Friends Of Hue in action. It may have been less effective during the day than it would have at night-time (or perhaps I should have just had a few more wines and put on some 3D glasses), but these literally are “ambilights” that work in concord to provide a home with the kind of flexibility in lighting that I’ve certainly lacked, and which has frustrated the bejesus out of me for decades. Oh for a few “Friends Of Hue” (but not Hugh) in a few of the overly lit motel rooms I’ve stayed in over the years; motel rooms that seem dedicated to destroying any vibe you want to build up with the person you’re trying to impress. But enough of that. The key thing about Friends Of Hue – comprising LivingColors Bloom and Lightstrips – is that it’s an app with which you can control your Philips lighting package. Okay, so every man and his peg-legged parrot has an app these days, but this one (although I haven’t yet used it myself) provides a vast range of options in terms of controlling your Philips lighting configuration. And it’s not just that you can turn a bright study light into a sensuality-enhancing “ambilight” with the push of an iPhone touchscreen, it’s that you can remotely set your lighting to turn on or off or whatever. The other great thing – and huge kudos to Philips for this – is that the app is open source, which means that developers can come up with clever things to do with the lights, none of which involves turning them into lasers and pointing them at large air craft. On the day, I was shown a list of such open source doo-dads, and they ranged from the sublime to the utterly ridiculous. But there’s no obligation to go down Silly Road, or even Extensive Lane with this system. Even just working with the basics, life is bound to become so much simpler, and the really super thing is that the system makes great use of new-gen LED bulbs that reputedly last for up to 15 years. Shall I repeat that? Yep, LED lightbulbs are expensive, but imagine not reaching up and having to change a scorched bulb for 15 years! Wicked! [Mind you, when I tried to tell the lady at my local Mitre 10 that I’d be back for a refund on my Philips LED bulb if it crapped out in 14 years, she laughed like a hyena]. But wait there’s more, and this is really cool, folks: “Using the internet automating service IFTTT (If This Then That), Philips Hue enables you to hook up to the internet via your smartphone or tablet and use the Friends Of Hue as indicators for weather, stocks, sports scores, social media and more internet services. They can be set to behave in any way you choose. For example, the lights can change colour if it’s going to rain and blink if you get an urgent email. 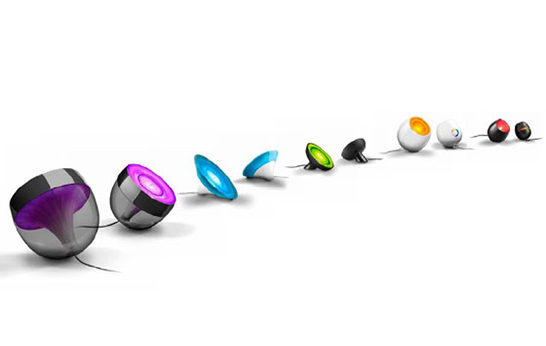 They can also illuminate gradually as the sun sets, or flash in your sports team’s colours when they score. So, what do you need to get up and running? 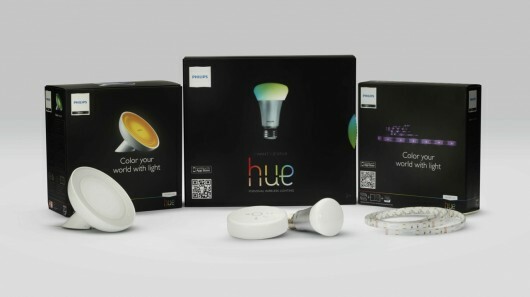 There’s the Philips Hue Starter Kit, which includes the Hue Bridge. 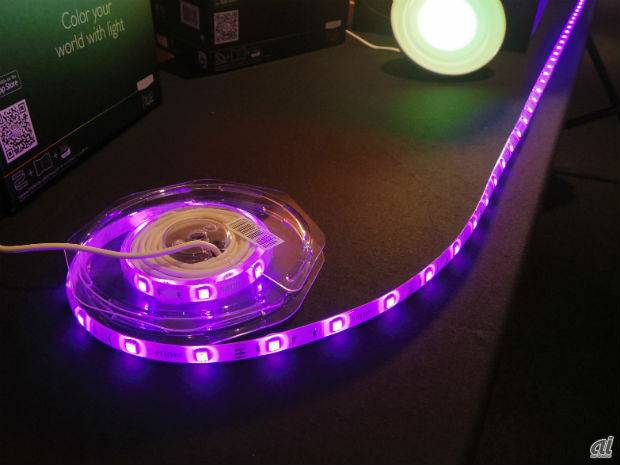 Then there’s the Hue Living Colors Bloom, and the Philips Friends Of Hue LightStrips. Altogether, that will set you back $539.85, which sounds like a lot for a bit of lighting, but I reckon, when you consider what it actually does to enhance a living space, it’s a rip-roaringly great deal. I love my Hue lights. While they initially seemed seemed gimmicky, I saw a real use case upon discovering the Logitech Harmony Ultimate remote control. As soon as I choose an activity on my remote, my lights can dim / change colour / brighten to a selected preset. Meaning, when I choose ‘Watch BluRay’, the lights in the room dim almost the entire way down, leaving me in a perfect lighting environment for movie watching. Sure I have them setup to flash red when the other half comes home… and sure they flash when I get a message on BookFace, but really, it’s all about the presets and being able to easily alter the lights when sitting in the room. The remote means there’s no need, a bit like the remote app for the Harmony remote control, come to think of it.